ANGLO-SAXON. Harthacnut. 1035-1042. AR penny. 1.014 gm. 17 mm. Earlier Jewel Cross type in the name of Harthacnut. Stamford mint, Lifinc moneyer. Diademed bust left (North fig. 2); +HARDACNVT RE around / Jewel cross; +LIFNC ONN STANF around. S. 1166. N. 809. BMC Type i. Near Extremely Fine; essentially as made; slight waviness; slight graze on the cheek; single peck mark on obverse; attractive light blue gray toning over fresh surfaces. This Harthacnut moneyer listed for Lincoln, London (LIFINC; Hildebrand) but not listed for Stamford in North, BMC, or Hildebrand. Nor is this type listed for the Stamford Mint. 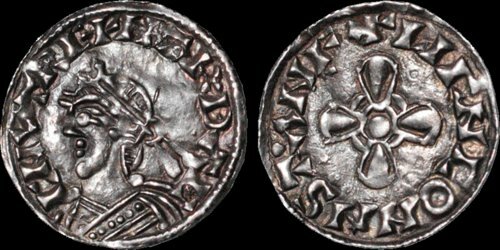 Stamford Mint citings in SCBI 40 (Stockholm IV: Harold I and Harthacnut): 57, 58. Harthacnut and right facing bust, Godric and Godwine. 1712-1720 and 2059. Harthacnut arm-and-sceptre type.